Buses that provide connections Milan – Venice leave from Milan from the bus station Milano Lampugnano that is situated near the similarly named metro station Lampugnano (line M1). Buses that provide connections Venice – Milan, in their turn, leave Venice from the bus station in Tronchetto island in Venice on Piazzale Isola Nuova, that is situated just near so called minimetro People Mover. (Minimetro — is an atomized type of transport in Venice that looks a lot like a funicular). 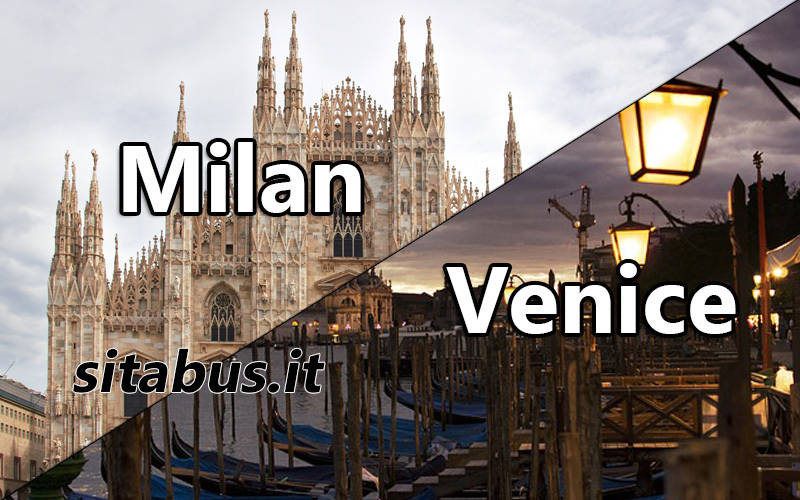 Buses Flixbus offer direct connection 400 Milan – Venice – Milan. Average journey time is 4 hours. Tickets cost from 9 EUR and above. It is possible to buy tickets online, in travel agencies and in different ticket offices at the bus station. From Milan buses leave from the bus station Milano Lampugnano at 8.30, 13.30 and 17.00 from Monday till Thursday. In Venice the buses also stop in Mestre. The final stop is Tronchetto, where buses arrive at 12.45, 17.45 and 21.15 accordingly. From Friday till Sunday buses leave from the bus station Milano Lampugnano also at 20.00 and arrive in Troncetto at 00.10. From Venice buses start their route in Troncetto at 8.00, 11.00 and 15.00 from Monday till Thursday. The bus stops in Mestre at 8.25, 11.25 and 11.25. In Milan the bus arrives at 12:20, 15.20 and 19.20 accordingly. From Friday till Sunday the bus leaves Troncetto at 8.00, 11.00, 14.00, 18.30. The bus arrives in Milan at 12.20, 15,20, 18.20, 22.50 accordingly. Also gruppo Baltour offers connections Milan – Venice – Milan but there are no direct buses. The bus goes the whole way through Brescia, Verona, Mantova, Padova and Mestre. The average journey time is 7 hours. The average cost is 33 EUROES. It is possible to buy tickets online, in travel agencies and in different ticket offices. Buses BusCenter offer connection Milan – Venice twice a day: at 7:00 a.m. and at 5 p.m. From Venice to Milan the bus leaves at 8:00 a.m. and 6 p.m. The tickets cost 3 EUROES if they are booked online beforehand. It is possible to buy tickets online, in travel agencies and in different ticket offices in the bus station. From Milan the buses leave from the bus station Lampugnano, bus stop B3 (line M1). Megabus offers connection Milan-Venice that goes through Verona and Padova. Average journey time is 4 hours and 20 minutes. Tickets cost 9 EUROES and more. It is possible to buy tickets online, in travel agencies and in ticket offices in the bus station. The bus from Milan leaves the bus station Lampugnano at 1.45 a.m. and at 13.45. In Troccetto the bus arrives at 6.05 and 18.05 accordingly. From Venice to Milan the bus leaves at 12.00 and at 23.59. The bus arrives in Milan at 16:20 and at 4.20. It is also possible to take a train . The average cost for the train Trenitalia costs around 38 EUROES. From the train station Milano Centrale the train passes Venezia Mestre and Venezia S. Lucia.